Sorry, we are currently sold out of 'Unusual Lavender & Green Large Faceted New Jade Beads'. Please check back later. 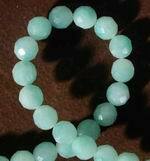 Sorry, we are currently sold out of 'Silky Teardrop Aventurine Beads'. Please check back later. 6 Large Pyrite Green Aventurine Button Beads - Heavy! 17 Massive Aquamarine-Green Matte Amazonite Nugget Beads - Heavy!